Randy Robinson holds five world records in the powerlifting event of bench press. Numerous times, the Summit Point resident has lifted over 600 pounds, equivalent to about half a grand piano. He earned his first two records in the men’s 45-49 division, 259-pound weight class, after bench-pressing 600 and 625 pounds. He holds the records for lifts in the same weight class for the men’s 50-54 division, for a 630 and 650 bench press in events where he used single- and multi-ply bench shirts, performance enhancing supportive garments used in competition. He also pressed 600 in the 242-pound weight class, single-ply category. Now 53, the 6-foot, 240-pound Robinson is itching to keep competing in the sport, knowing full well he can be competitive for many more years as long as he’s healthy. When did you first start weightlifting and how did you discover it? In high school, a couple of buddies of mine were both powerlifting and I used to hang out with them. After high school, I started working full time at Dixie-Narco on the second shift. A friend and I would get off a midnight and we’d go to the gym after work around one in the morning and lift for a couple of hours two or three nights a week. When I started seeing results — getting bigger and stronger — I just got hooked. A friend of mine was doing it, and I was keeping an eye on his progress. My first event was at Musselman High. I was 24 or 25 years old and I think I benched 290 pounds. Competing gives you something to work towards, and it motivates you to stay in the gym and stay with it, because just working out without a goal can get a little boring. When I go to a meet, I go to compete against myself. I don’t even look to see who’s there; I just try and beat my weight by five pounds or more. What made you keep competing? The motivation to do better, meeting new people, trying new routines and getting stronger. What engages you about the sport? It’s not a team sport. It’s just you, your weight class and the bar. It’s like wrestling. There are weight classes, but it’s just you or nothing. I’ve seen some real impressive lifts in my career. I’ve seen people benching 900 pounds pretty easily. You’ve won five world championship titles. What were the special highlights to each of those titles? The first one was pretty cool. I lifted at York Barbells, where they have a world meet. I was lifting with the International Powerlifting Association. I set a record in that federation first and I met people from Europe and all over the country. That was a highlight. 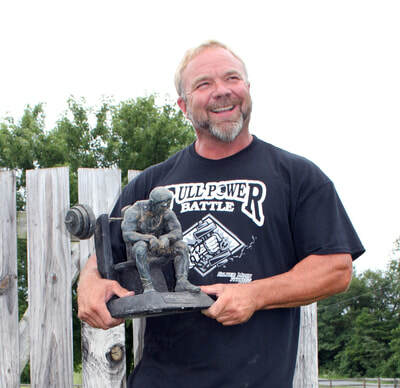 I benched 545 at that meet and got Best Master Lifter, which is awarded to competitors over 40. Every time I’ve competed, I’ve set a record or had a record and beat it. So, they all stick out to me a little bit. Lifters are allowed three attempts, but how are the meets structured? When you get to a meet, you weigh in, are assigned a weight class, and you have to tell them what weight you are attempting to lift. You open with something you know you can do since after your first attempt, you have to go up in weight; you can’t go back. You are assigned a flight, which is where they group people attempting the same weight together. You do your opening attempt, have a rest then wait for your next flight. At a lot of these meets, I’m the last lifter in the last flights because I am lifting so heavy. 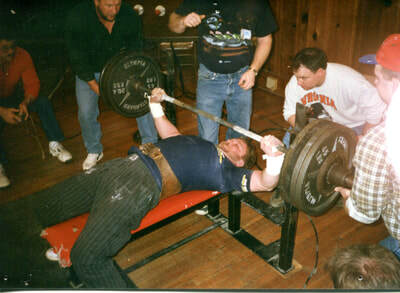 Powerlifting competitions include the squat, deadlift and bench press. Have you competed in other events besides bench press? I used to squat real heavy but hurt my back. I like the squat the best, but after tweaking my back, I started benching. Those are my two favorite lifts. How many governing bodies are there for competitive weightlifting, and is there truly one world champion per weight class and age? There are lots of them. 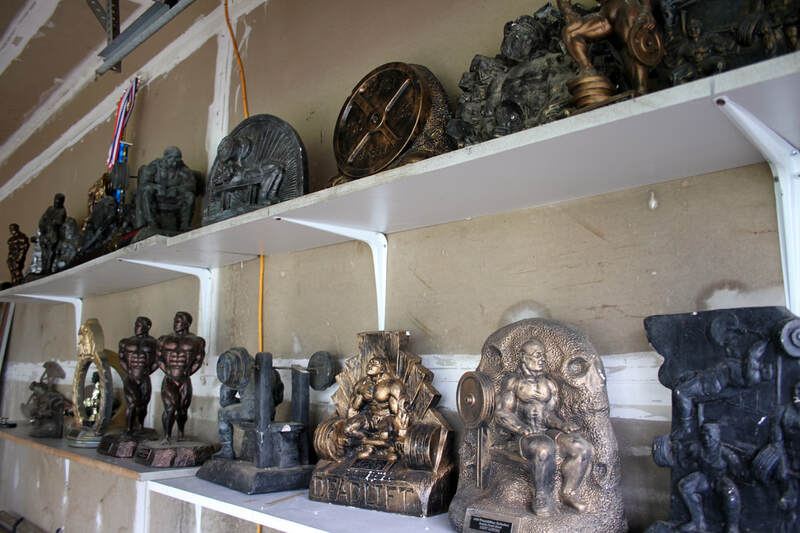 There used to be a just a couple back in the day…IPA, IPF [International Powerlifting Federation] and SPF [Southern Powerlifting Federation] but there are many more now. The reason I lift in the SPF is they have a 242-pound class and added a 259. I usually weigh around 245 competing, but if I try to cut enough weight to get down to 242, I find I cramp. I had two world records in the IPA previously but they’ve both been broken. I have standing records right now, and as soon as I turn 55, I will turn around and barring injury, grab two more. Back when I started, there were only a couple of guys at the top of each weight class. I’d like to see all the federations get together and have their classes compete so one guy could be crowned. The way it is now, it’s hard for there to be one world champion. You can lift in as many organizations as you like — they are basically all the same, with a few differences. It really boils down to which one you want to give your money to as you have to pay annual fees to be in a sanctioned federation. What is your sports background — were you athletic in your youth? I am a sportahlolic. I played Little League baseball and football through the Eastern Panhandle Midget Football League. I was pretty good at baseball, making all stars every year. As an adult, I played fast pitch softball, and I played with some of the really good fast pitch players in the region. Then I went on to play slow pitch and tournaments. I still umpire church league softball and referee football for the Midget Football League. Does it surprise you that you’ve achieved this success? It kind of does, but I’ve been really focused. I don’t miss too many workouts. It’s a way of life for me…keeps my stress levels down and I haven’t had serious injuries which would take away from lifting the kind of weight I do. Consistency and different training methods have gotten me where I am. 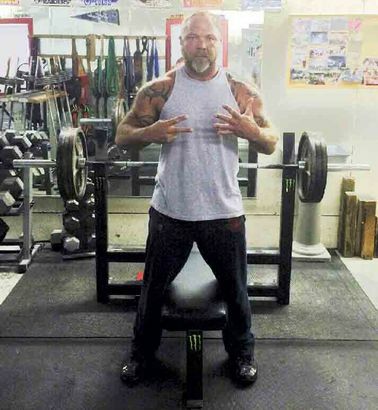 Louis Simmons from West Side Barbell in Ohio, who is kind of a powerlifting guru — I’m sure any serious weightlifter has heard of him — especially helped me. I’ve picked up his training methods, using bands and chains for resistance, and I have a lot of routines from his basics. It’s amazing how many gains I saw. Most who train that way do. Has anything derailed your success or momentum? How have you overcome those moments? I’ve had a few shoulder issues. I’ve had a plasma therapy done on it. My doctor down in Herndon has worked on NFL players because people here wanted to do surgery on my shoulder but this was an alternative. The plasma therapy took away the issues I was having. I’ve had also had a lot of support from my family. It’s a way of life so everybody that knows me, knows I don’t miss too many workouts. How has competitive lifting changed since you’ve been involved? People have gotten a lot stronger. Records go up and up. A lot of people wear bench shirts, which is worn in the assisted division. It’s a tight shirt that keeps you supported, gives you a little edge off the bottom. There are all sorts of different kinds. There’s actually a thing called a slingshot — a band that goes behind your elbows — that helps you lift. Training tools are better, and there are a whole lot of supplements and protein choices now. People are just getting stronger. But what’s nice in our community is that everybody helps everybody, giving tips and pointers. We don’t get paid a lot of money to do this stuff. 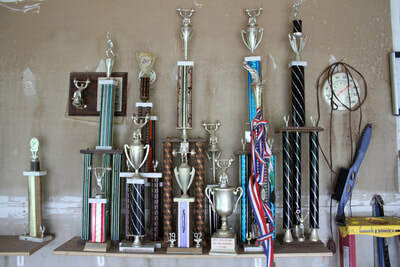 I have won a few meets that paid out and I’ve won battle-axes, Conan axes, samurai swords, each a trophy of its own sort. The stuff’s all real. There are also sculptured awards and more traditional trophies. 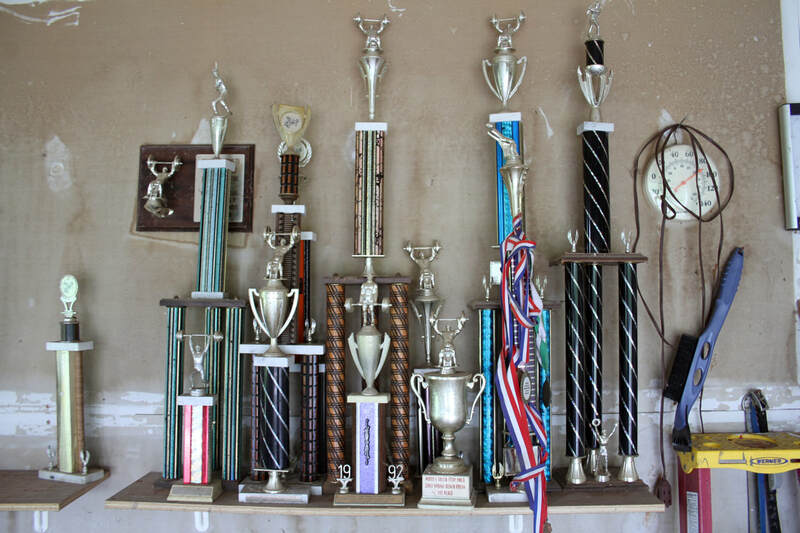 I’ve got a big collection in my garage. Masters categories have become more popular and people are competing in comps sometimes into their 70s. Are there age limits for the types of comps you are doing? When you reach age 35, you are a submaster, after 35, the categories go in five-year increments but there’s no limit. There are also high school/teen categories, which were the biggest classes our last couple of meets this year. That’s fantastic. How many competitors are usually at the meets, and are there women competing? We usually have 60 lifters at a meet, at least six deep in each class. There are usually three to five women. It’s still predominantly male, but at the big meets, there are more women who compete. How have you given back to the sport? I’ve trained some high school kids. One was a basketball player from Hampshire High School. He just graduated from Ohio Valley University where he had a full ride for basketball. Now he’s looking to coach locally. I trained a football player from Sherando. He plays football at a college down in southern Virginia. I’m currently training a young man from Charles Town. I’ve been working with him about six months. I took him to a competition and he set a record in bench press. He just graduated from Washington High School. I’ve also put meets on locally the last 20 years or so. The gym I belong to over in Winchester, the Power Pit, also holds meets. I understand you also trained your stepson, Brett Maness, and won some competitions together? I worked with Brett starting at age 12 and he also started lifting with local boys. They were all wrestlers for Charles Town Middle School and continued at Jefferson High. They started lifting to get stronger for wrestling, and I worked with them. I enjoy helping the kids. 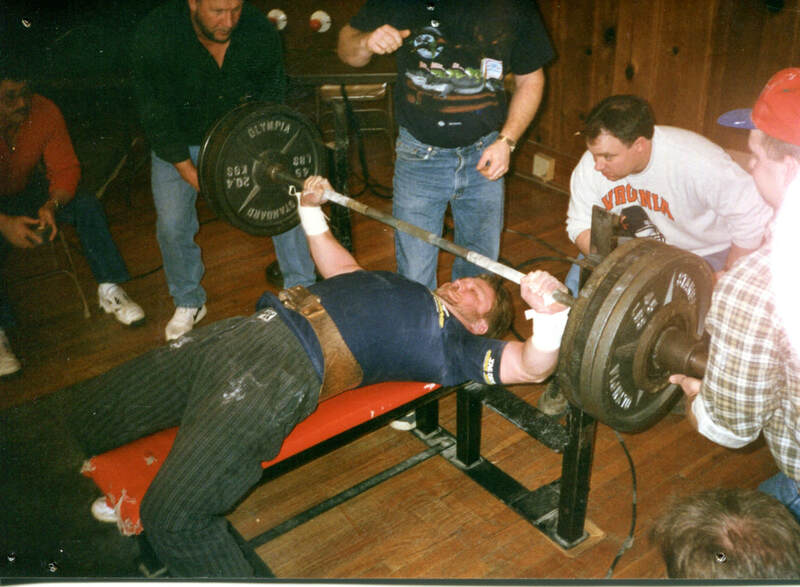 Brett and I competed in two meets and during one down in Fredericksburg in 2001, I won my class and Brett won his second career title in the teenage division in bench press. He benched 280, almost got 300. But he stopped competing once he got his license and started working. He was very athletic and strong for his size. I was hoping he’d stay with it but it’s not something you can push on your kid. It’s something that’s got to click, that they need to like doing. As soon as sports ended, he got away from it. I also read your daughters may be interested in lifting. Is that true? My oldest daughter, Lauren, was interested in it. She was also very athletic, a competitive cheerleader. She went to James Wood until her senior year then transferred to Washington. She used to work out with me in the basement and came to meets with me but she never competed. I actually took her to a meet once back when she was a toddler, and a friend and I passed her back and forth while we competed. When I accepted my trophy with her in tow, people got a real kick out of that. I have a younger daughter, Carly, who is at Washington now. She works out for basketball in our basement gym where she has a routine written on the board. She tells me she wants to compete. Of all of them, she would be the one to try it. She’s a great kid and has come to a lot of meets with me over the years. We’ll see down the road what she wants to do. Right now she just lifts to stay in shape, more or less. Are your kids impressed that you’re a world champion? I don’t think they really grasp what a world champion means. Sometimes their friends ask me, ‘You bench how much? C’mon!’ And they’ll tell my kids how impressive it is. Lauren has a little more insight into what I’m doing, so she probably has the best idea. And my wife is at the point where I’ve been doing it so long, she was impressed in the beginning, but now I think she worries about me getting hurt. What would you recommend for the aspiring competitor? Consistency…you gotta keep doing it. You can train hard for a month and then not lift for two weeks and lose it all. Strength is hard to come by and easy to lose. There are meets every weekend somewhere and you might have to drive a bit to get there, but anyone can compete. I recommend doing that as you train. You previously said you’d like to still be able to bench 600 when you’re 50, stating only six guys in the world had done that at 50 and you hoped to be one of them. You’ve clearly crushed that, so what are your future plans in the sport? Just to try and stay healthy and compete without having a major injury. I’d like to compete when I get to 60 as the records go way down when you get into the older classes. I want to keep going. I am going to try and beat my current world record at the SPF sanctioned Maryland State Winter Challenge in Hagerstown this December.